It's almost 2008, so let's kick off the year with a bang - make a donation to your favorite environmental or free trade charity today. Next year is bound to be an even better year for the environmental movement than 2007 was. In 07 we saw increased global action about Climate Change - even from President Bush! We saw more companies offering green products, more start ups entering the marketplace and more customers buying their wares. 08 will see the movement grow, and we are at the forefront of it all. Let's give it a nudge with a buck or two. Conservation International is a large global organization that studies and protects the environment through an extensive, high profile network of scientists, governments and companies. This year, they are doing a year end dollar-for-dollar match for all donations called The Friends and Family Challenge. Protect "organic" standards with a donation to Organic Consumers Org. They are a non-profit watchdog group that is keeping an eye on all those sneaky multinationals trying to get in on the organic movement and in the process, loosening the definition of organic so they can use the term on more products. We buy organic so we don't have to worry about what we're eating... if you don't want to worry, then donate to a watchdog to keep them honest. Go Solar this year without putting panels on the roof. Bullfrog is a Canadian alternative supplier which adds electricity to the existing grid and delivers through the existing distribution network. They sell 100% green power, 20% from wind and 80% from Brascan's EcoLogo certified hydroelectric sites. You can pay more for their power instead of paying your normal supplier. Basically, they add what you subtract to the grid through a deal with your local utility. Take a look at what your money is doing. Do you know what kind of investments you're involved in through your IRA, 401K, mutual funds etc? Are they working for or against the environment? Maybe it's time to find out and move some things around. Social Invest and Ceres are both endorsed by Al Gore. This is something on my list this January. VOTE this year and write letters to your reps!! It's a big election, I know, we're already sick of it. But there is a lot of important work we need to do. But voting is more than marking down who you want for president, it means getting involved. League of Conservation Voters keeps an environmental scorecard of various government reps. Check it out and be involved this year. Replace your christmas tree? Plant a tree per month? Plant a tree per day? Planting trees helps reverse deforestation and global warming. Let's start planting. An environmental charity near you. For local organizations, check out this helpful site. So, it's the holidays and, like everyone else, I've been shopping. My husband likes those Cuban shirts for going out, the Havana brand, so I went to JC Penny's where they sell them (although this year, their selection sucked). But while in the men's department, I found Organic Cotton Levis. They had a few styles and colors and they were reasonably priced! I was psyched!! Such a mainstream, lowest common denominator store had some Eco friendly wares. So, maybe your local JC Penny's carries them too. I was reading "Preen" Magazine recently and saw this illustration and recognized one of my favorite west cost illustrators, Mel Kadel, instantly. Upon reading the caption, it said it was on an organic t-shirt for Volcom's holiday eco friendly collection. I wanted to buy one, of course, so I headed to volcom.com and didn't find the t-shirt but found out that the skateing outfitter had a whole line of organic cotton T's, jeans and hoodies (I saw only for men, but the ad said the women will have it too... confusing site). I don't know if I would call Tom's shoes "shoes" since they look and feel more like slippers, but this company is doing something interesting, even if their shoes aren't. Tom's will donate a pair of shoes to a child in need for each pair sold. So buying a pair is like donating to a good cause, and you should look at it that way, because they cost almost $70 a pop. 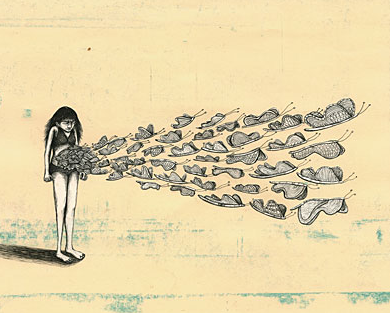 Still, it's a great concept and they're doing it for real - check out this charming video of a shoe drop in Argentina. Velvet Leaf's spring 08 collection is fun, fresh and feminine. The line's style is youthful with a bit of sophistication, hip with wearability. I'm not sure where you can buy their cloths, but definitely keep your eyes peeled for their wares. Velvet Leaf is committed to 100% sustainability and is certified by EKO SKAL. They use 100% organic cotton and work with internationally certified factories that have a proven record of practicing fair labor. 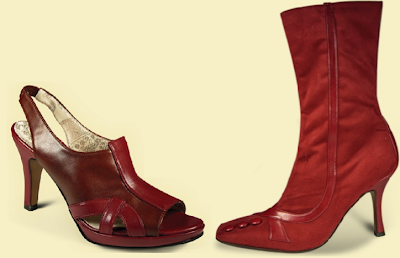 Charmone Shoes is an Italian shoemaker who uses vegan materials - but you wouldn't be able to tell that the shoes are synthetic because they are designed and made to the ultimate in luxury standards. Their synthetic materials use a process that is less polluting to the environment that the process of tanning, factory farming and processing leather. Plus their materials are free from PCV. The company claims to incorporate sustainable practices throughout the production process including using recycled materials when ever possible. To break away from fashion for a moment, I recently was surfing design*sponge and one of their guest bloggers, style court, did an interesting post about an interior designer in LA. Ruthie Sommers is a magician when it comes to refurbishing old furniture. The post includes some before and after pics I wanted to share. You can check out the whole post here as well as learn a bit more about Ruthie and her store in LA. Now here's a designer who's thinking outside the box. 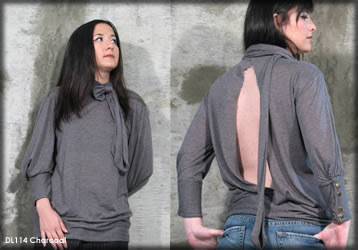 Lara Miller designs transformers - you can wear the garments in different ways. One way on Monday, another on Tuesday. 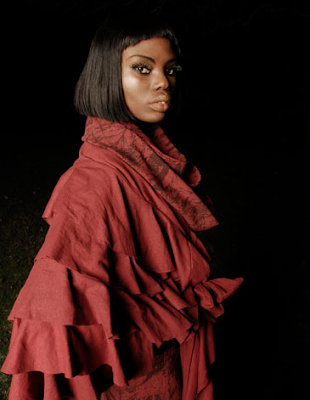 Flowing fabrics can be wrapped, strapped, tied and twisted into different looks. It's an interesting concept and I can't wait to find one of her pieces in the person so I can transform one myself. Some of her pieces are made from bamboo jersey and knits although her website doesn't seem to discuss political and environmental issues. I found a few pieces available at gwg while her website laramiller.net has some pdf downloads of her collections where you can seen some transformations for yourself. I'm in love with Passenger Pideon's Fall Collection. The screenprinting is adorable with birds, trees and windmills in patterns accross their fabrics. The designs are timeless, not trendy, so these outfits will be in your wardrobe for a long time. I think I'm going to pick up the red wrap dress for this holiday season from their online shop. Check out the whole collection here. Ok Econistas, the ultimate shop, so it would seem, has hit the net... but it's a UK based company (ouch on the carbon footprint)... at least the north west passage is free of ice so shipping will be faster over the pole.... ok, very bad joke. For the econistas in the U.S., this shop has a lot of items to salivate over. The company declares on their website that they hunt down the sexiest, hippest and most luxurious ethical fashion to create a one-stop, ecofashion e-tail boutique. Yippee. So without further adieu: shop. Later this month, Goodwill is going to become a destination for econistas in San Francisco. As Nick Graham, founder of Joe Boxer, is going to craftily alter some of Goodwill's old, donated cloths, into new, fashionable wares for sale in a new section of Goodwill's Fillmore store. Called William Good, the new clothing line will spark people's creative minds while doing something for the environment. vintage 60s faux fur cape coat white at CHERRYPICKVINTAGE shop. 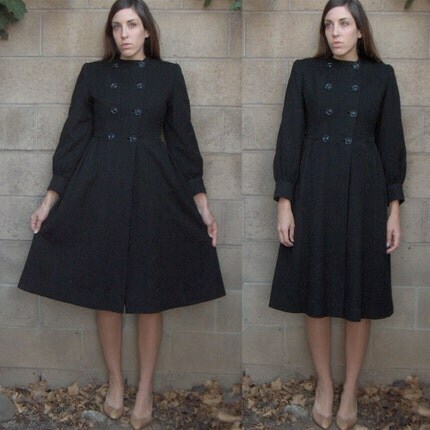 vintage 1960s BABYDOLL double breasted black wool coat FITTED cutest all at ramonawest's shop. 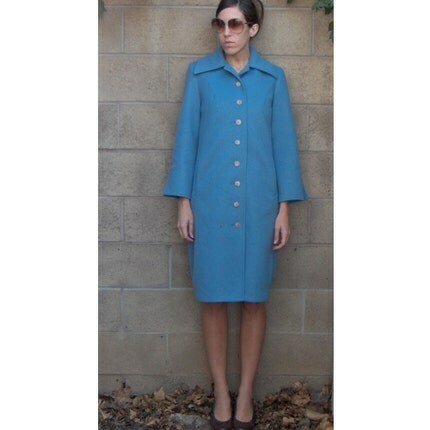 Finally, this handmade super cute...i think im gonna buy it...French Provincial Jacket - Hand Sewn French Recipes Print Empire Jacket Top Womens Size Medium made by creatrixjane is a perfect conclusion to this Etsy Roundup. Peligrosa Knits produces some fine basics for the econista who loves cashmere long or short sleeved sweaters. Some of their more styled designs, like the ruffle boatneck shown above, are made from 100% organic cotton. The company is dedicated to sustainability throughout the production of it's collection. Beyond using organic cottons, they use natural organic dyes and natural mordants that are derived from roots, herbs, fruits and vegetables. Naturally fermented indigo is a signature garment dye which you can find on some of their fine cashmere sweater coats. To take it a step farther, the company uses all recycled paper printed with soy dyes for their packaging and their shipping bags are 100% biodegradable. You can find this LA based company's wares at fine boutiques nationwide. The Viridis Luxe mission is to provide sustainable luxurious clothing to those who are making the choice to tread lightly on our planet while continuing to enjoy fashion, luxury, and style. 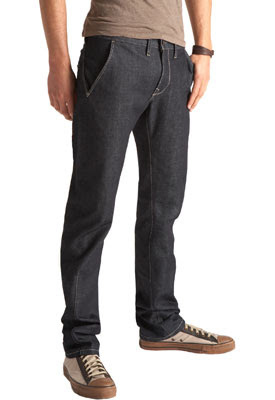 Their signature organic fabric is a blend of the fine cashmere with long-fiber hemp. The Viridis Luxe line also includes exotic bamboo t-shirts and exclusive sheer silk~hemp collection of jersey tops. You can even buy their wares online at nordstroms. The world can be a heavy place full of stress and mundane routine. Tees for Change to the rescue with a healthy dose of positive reminders about living a full life. With messages like "choose happiness", "today matters", and "live mindfully" wearing them can be as much community service as it is therapy. Beyond tees made from organic cotton or bamboo, the company is further dedicated to sustainability by partnering with American Forests Global Relief who will plant a tree for every shirt you purchase! Now there's real world positivity. There's really no reason not to get one. Why do companies market themselves as pink ribbon leaders in the fight against breast cancer, yet use hormone-disrupting and carcinognic chemicals that may contribute to that very disease? Why do they put chemicals linked to reproductive harm into products used daily by men and women of childbearing age? As doors slammed in their faces and the beauty myth peeled away, the industry’s toxic secrets began to emerge. The good news is that while the multinational corporations fight for their right to use hazardous chemicals, scientists and entrepreneurs are developing safer non-toxic technologies and building businesses on the values of health, justice and personal empowerment." This is a very important read that's going to the top of my reading list. After discovering this spring that the strange nagging raspiness of my respiratory system was caused by Bare Minerals, I was slapped awake and realized that the makeups and beauty products I was using might not be good for me. The realization lead me to the Campaign for Safe Cosmetics and subsequent research made me throw away my collection of products to start from scratch with all natural ones. But the issue still nags me, especially after years of using acne products which use a lot of chemicals and considering I've been trying to conceive for a year now, perhaps this book will have some answers. I'll do a post after reading the book. The database is awesome and terrifying. 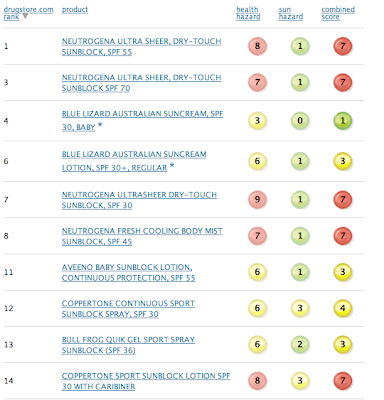 Above are the top selling sunscreens. The higher the number, the more toxic it is. They have ranked hundreds of brands and to no surprise, the most main stream brands are the most toxic. Anti-aging products seem to have the largest effect on reproductive organs. Every woman should check this out. They are killing us girls, we need to be empowered! Davina Hawthorn's love of textile design is exposed in these full and fabulous jackets. Her fascination with fabric is shared with all those who view her hand crafted pieces (made of recycled fibers) through shape and texture. One of the original designers showing at Esthetica at London's Fashion week, Davina Hawthorn has seen success as a sustainable designer. She's been commissioned to design costumes for theatrical and television production and won awards for her visionary sensibility. They rock, love their episodes. Subscribe at their site. 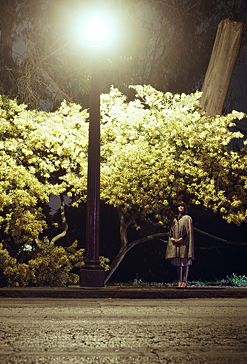 Perhaps it's the charm of Covet's photography, but their collection feels both modern and retro at the same time. Their styling offers some trend pieces paired with timeless ones to make a complete wardrobe that will last more than one season. Covet's line features all natural fabrics including bamboo (sweater above, vest, boatneck top and polo bellow), linens (crop pants) and cottons. In this collection there is something for any dreamer and lover of adventure whether it be super soft pima pieces or trousers, trumpeted skirts and delicately detailed hand knits. Grace Trance designs wonderful clothing for working girls. Her sensibility is elegant and sweet contrasted with a very organic textured fabric made of hemp. Made in San Francisco. Keep an eye out for her collections. Ok, so I've been slacking off, a full week passed before doing a post. So to get back into the swing of things, I thought I'd show you guys a mainstream product that's not exactly eco-chic, but it's doing something for the environment. Save the environment, save the world. First the show is partnering with The Conservation Fund who's Go Zero program will plant 188 trees at the Trinity River National Wildlife Refuge in East Texas that will neutralize the carbon footprint from the tour. Second, they're selling 100% organic cotton and organic ink t-shirts made in the USA! Cool! Third, 50% of the proceeds from the shirts will be donated to The Conservation Fund, the nation's top environmental nonprofit. you can buy one here. What a great idea, a piece that can be worn a few different ways, even after your pregnancy. Jesica Scott designs a lot of cute, flirty pieces made from Lyocell and Tencel. The first Skunk Funk shop in North America opened near my house in the Mission S.F. I was surprised to learn that many of their wares are sustainable, or at least blends! Soy, Viscose, Bamboo and some Organic Cotton. So I scooped up a cute top made of 95% viscose (the rest elastic) and I'll be checking back regularly. The designs are very modern with a euro-techno edge. I'm into the look (although the green is way too prevalent). I believe they're out of Spain and have 700 stores across the globe. This is one brand to keep a look out for! 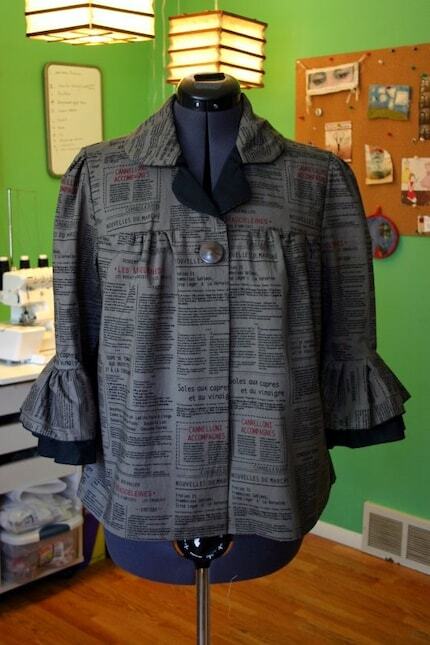 Urban Renewal by Mari Santos recycles T-shirts and makes cute outfits. She's a design student from Toronto. 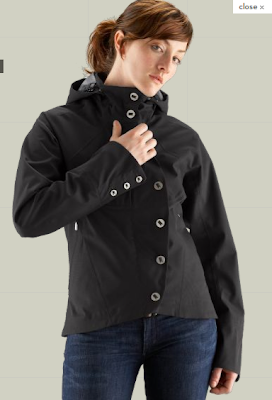 Check out Nau's urbane jacket. It's made from 100% recycled fabric that uses Teijin Eco Circle techonolgy, a closed-loop recycling system for polyester. Nice! Any fans of America's Next Top Model might recognize this season's model for Beau Soleil. Melrose does a nice job of showing off the collection's comfortable and stylish designs. The collection boasts some innovative touches such as this asymmetrical dress with a removable recycled leather strap to make a fun strapless as well. Or this dress which is simple and sleek for the office with a neck detail that reveals some skin making it perfect for happy hour. Anne Salvatore Epstein, launched her eco-friendly dress collection called BEAU SOLEIL, named after the designer's favorite oyster. The company's focus is on sustainability, fair trade and labor, as well as organic raw materials with the end goal to offer consumers environmentally healthy clothing choices without sacrificing fashion.